Although eleventh-century Vikings did not have magnetic compasses at their disposal, it is thought that they could determine their orientation at sea using sun-compasses. Sun-compasses use the position of the sun's shadow to tell which way north is, and look somewhat similar to sundials, which use the position of the sun's shadow to tell the time of day. But the famous Viking-era wooden fragment that inspired the idea that Vikings used sun-compasses contains some lines that don't quite match scientists' interpretations. In a new study, a team of researchers has proposed that these flaws hint at the possibility that the instrument served a more sophisticated purpose than determining orientation, which was determining latitude. The researchers, Balázs Bernáth, et al., from Eötvös University and Estrato Research and Development Ltd, both in Budapest, Hungary, have published their paper on their alternative interpretation of the Viking sundial in a recent issue of the Proceedings of The Royal Society A. One of the most prominent pieces of evidence for Viking solar navigation is a fragment of an eleventh-century instrument found under the ruins of a Benedictine convent in Uunartoq, Greenland, in 1948. The fragment is half of a round wooden disc with a diameter of 70 mm (2.75 in.) and many deep scratches. Forensic experts have proven that some of these scratches were deliberately engraved. In previous studies, researchers speculated that two of these scratches are gnomonic lines, which mark the paths on different days of the year of the tips of a shadow cast by a single pointer or "gnomon" that stuck out from its center. This gnomon would have functioned similarly to the triangular gnomon on a modern-day sundial, which also casts a shadow on the dial. As the sun rises and nears the zenith at noon, the shadow shortens, and as the sun sets and approaches the horizon, the shadow lengthens. By rotating the dial to fit the gnomic line right under the shadow tip, a navigator could always determine which direction is north. One of the lines runs precisely from west to east, and is valid on the days of the equinox. The gnomonic lines suggest that the tool was a sun-compass used to determine orientation. "This very artifact was studied in detail in the past decades and a quite sound interpretation—the sun-compass—was formed decades ago," Bernáth told Phys.org. "Counterpart sun-compasses were tested on small sailing boats—even on replica Viking ships—and performed well, thus the sun-compass theory was widely accepted. It is a valid solution, but not the only possible solution, and it also has weaknesses." One problem with the sun-compass interpretation is that the gnomic lines don't extend all the way to the end of the dial, but terminate prematurely. The truncated lines would have made it impossible to mark the path of the sun's shadow past a certain time in the late afternoon. Another problem is that the gnomic lines and some of the other lines on the dial are off by a few degrees, which would have sent the sailors many miles off course. 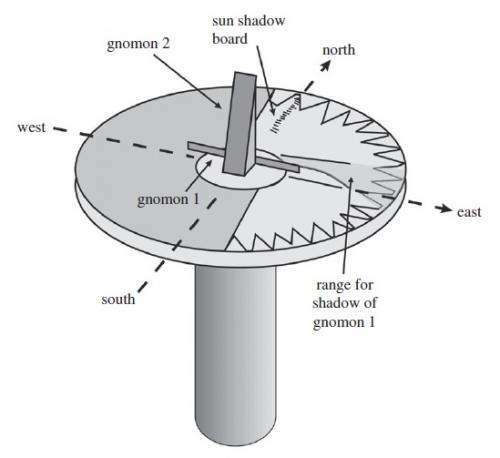 In the new study, the researchers suspect that the gnomic line truncation and imprecision are not the serious flaws that they may seem to be because the device may have been used not primarily to determine north, but to help navigators determine local noon, which in turn enabled them to determine their latitude. In order to read the latitude with such a device, a navigator would have had to measure the sun's shadow precisely at noon, and the gnomic lines would have assisted with determining the time of noon. Knowing their latitude would have enabled the navigators to stay on course on their many east-west voyages between Greenland and Norway. All in all, the researchers' interpretation suggests that what would have been serious flaws for a dedicated sun-compass would have been much more minor concerns for a sun shadow board. The gnomonic lines would not have been needed later in the day, so it wouldn't have been a problem that they terminate "prematurely." Also, the gnomonic lines would not need to be extremely precise, since they merely facilitate the navigator in timing the important measurement, the reading of the noon shadow. "Well, there is no one only perfect solution here; there can be more valid interpretations," Bernáth said. "The artifact is just a half-dial, so you can not even rely on symmetry. This is like a jigsaw puzzle with many missing parts. If you pick a corner piece, you can place the other pieces, but your chosen corner will define your solution. "In our case, the corner piece was the orientation of the artifact. In the sun-compass theory, a straight line is taken as the straight shadow-path of the day of equinox that runs from west to east. We chose another orientation, took the notches in the northern part to be a precise marking of north, and got a very different instrument. Instead of a direction-finder we have a position-finder, which has functional analogues in maritime history, e.g., the late medieval backstaff or the Indian/Arabic kamal. It is also interesting that our picture outlines traces of advanced astronomical knowledge that was an asset of ancient civilizations, but Northern Europeans are not supposed to have it in the Viking age. "But we have many missing parts in our puzzle and surely other researchers will come up with or will prefer other solutions. We hope archaeologists will find more compasses in the future—that is, they give more pieces for us!" 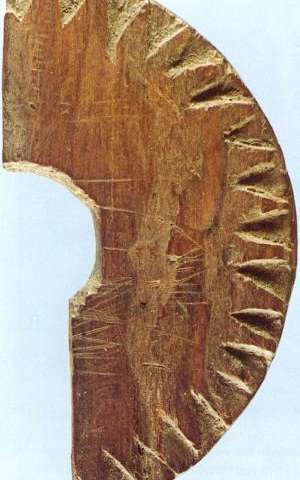 Still other questions regarding the artifact remain, such as whether there were trained professionals on Greenland who produced many copies of these instruments, and what kinds of construction methods they used—questions for future research. Bernáth and his coauthors' main area of research actually doesn't have anything to do with Vikings, but focuses on animal vision and navigation. "This is a minor project of our research group (Eötvös University, Dept. of Biological Physics, Environmental Optics Laboratory, http://arago.elte.hu), but it is very interesting," he said. "A main topic of or group is polarization vision and navigation of animals. Many animals (e.g., the honey bee) can track the occluded sun by looking at the polarization pattern of the sky, but humans are not able to do it without special instruments. The Viking sagas mention mysterious sunstones that may be the first such tools and could have be used for navigation together with solar compasses. That is why we got involved. Our goal is reconstructing how exactly could sunstones—most probably birefringent crystals—be used for skylight polarimetry and navigation with—or without—Viking-age solar navigation instruments." did they attempt to use a shadow source that was at different angles? but what mean is that it was well known that leonardo da vinci wrote backwards to hide his works, and so do many others. a navigators rudders are his life, and often, navigators put false information and such so that anyone who stole their rudders could not use them... and might die trying. brevity is the soul of lingerie!